An impact crater on Mars has a floor filled with huge blocks of chaotic terrain. THEMIS found the crater contains a thick stack of sediments deposited underwater. Aram Chaos is an ancient impact crater near the martian equator, close to Ares Vallis. About 280 kilometers (175 miles) across, Aram lies in a region called Margaritifer Terra, where many water-carved channels show that floods poured out of the highlands onto the northern lowlands ages ago. 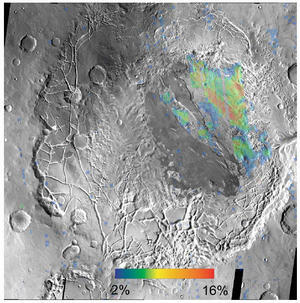 The Thermal Emission Imaging System (THEMIS) on the Mars Odyssey orbiter mapped the distribution of sediments in Aram Chaos. These sediments include gray crystalline hematite, first found in Aram by the Thermal Emission Spectrometer (TES) on the Mars Global Surveyor spacecraft. Hematite is an iron-oxide mineral that can precipitate when ground water circulates through iron-rich rocks, whether at normal temperatures or in hot springs. The floor of Aram contains huge blocks of collapsed, or chaotic, terrain that formed when water or ice was catastrophically removed. 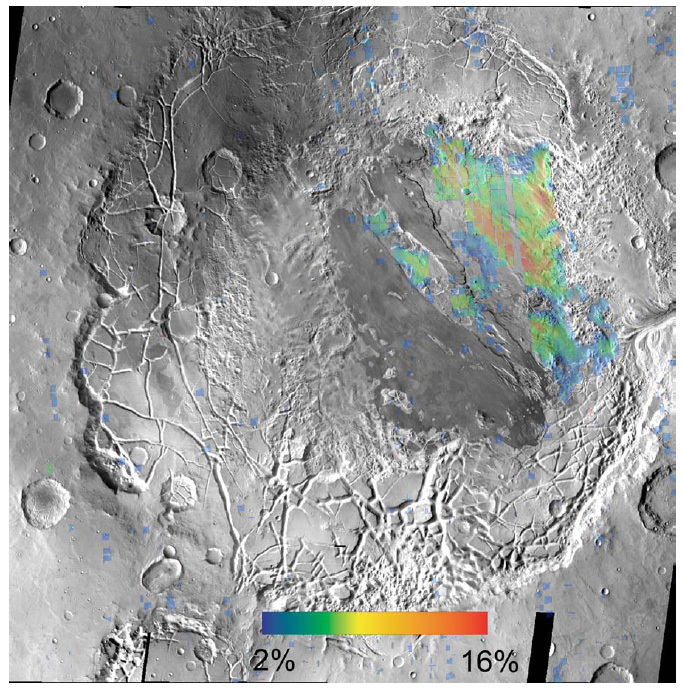 Elsewhere on Mars, the release of groundwater produced massive floods that eroded the large channels seen in Ares Vallis and similar outflow valleys. In Aram Chaos, however, the released water stayed mostly within the crater's ramparts, eroding only a small, shallow outlet channel in the eastern wall. Using THEMIS, scientists discovered the thick stack of sediments - including the hematite-bearing layer - lies on top of the chaotic blocks. The sediments' position indicates they were laid down in Aram after the chaotic terrain formed. This observation suggests the hematite unit in Aram Chaos was deposited in a water-rich environment, probably a lake within the crater. Further evidence for a lake includes the possible detection of sulfate minerals and a relatively high abundance of water-altered silicates in the layered units. There are several similarities between the hematite-bearing units in Aram Chaos and at Meridiani Planum, which lies about 1,200 km (750 miles) to the southeast. But the resemblance is probably only circumstantial because the two hematite layers formed at greatly different times: the hematite in Aram is about 1 billion years younger than the Meridiani Planum one. Because forming hematite requires liquid water, which could not long exist without a thick atmosphere, the age difference between the hematite units implies one of two things. Either a significant atmosphere endured for such a long time - or, more likely, the catastrophic release of water within Aram provided a temporary environment allowing hematite to form. If the latter is what happened, conditions during deposition were probably similar to what existed when the Meridiani Planum hematite was laid down, close to a billion years earlier. Glotch, T.D., and P.R.Christensen, Geologic and mineralogic mapping of Aram Chaos: Evidence for a water-rich history, J. Geophys. Res., 110, doi:2004JE002389, 2005. A geologic photo-map of Aram Chaos shows where the hematite is most abundant, ranging up to 16%. THEMIS scientists conclude that water ponded within Aram when the chaotic terrain formed with the release of much ground water or ice. This flooding, aided by possible geothermal heat in the crater's uplifted center, could have led to the formation of hematite.